Cheap is simply an expression! Cheap t-shirts are a way some people describe t-shirts but in actuality they are one of the finest values out there for your marketing dollar. 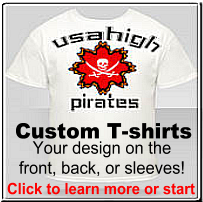 Keep in mind, custom printed t-shirts are a great advertising device. They will be seen by many people and you want to remember that. It is a grand sensation when all of your hard work pays off in the crucial accomplishment and you see your very own creation being worn by someone one the street. Custom t-shirts are good for countless reasons. 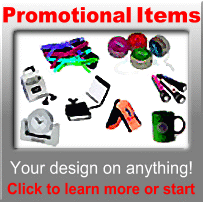 Promoting a company, support you band or favorite music group, generate school spirit or demonstrate support for your much loved sporting team. These are only some of the reasons people custom produce t-shirts. It can also be an unbelievable resource of profits. You can sell T-shirts as a fundraiser and build hundreds of dollars promoting them on the Internet or in a retail outlet. Who would have thought you could get custom printed t-shirts as low-priced as you can nowadays. The screen printing equipment continues to get better and screen printing process continues to get easier and more cost efficient. We have a staff of graphic artists standing by to help. We don't make you use a design lab that is confusing to most people. 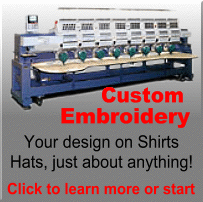 We can help you design just about anything you want on a t shirt. Here are just a few ideas we have done.